On a ministerial tour, a minister entered a particular home with the hope of explaining Yahweh’s truth. During the conversation the man of the house asked whether the minister’s wife ever accompanied him on such trips. “Oh, she never comes with me,” the elder answered. “She isn’t in the faith.” The incredulous man responded, “Then I have some advice for you — why don’t you go home and convert your own wife first before you presume to teach me.”Struggling with marital problems, a couple sought counseling from a minister. After a few extraneous responses to their questions, they asked him, “Are YOU married?” “Well, no, I’ve never been married,” he answered. They were skeptical. “If you have never experienced married life firsthand, how can you really help us solve our marital problems?”An elderly man who had been ordained for a couple of years was asked some questions from a somewhat younger elder. The younger minister hoped to gain some special insight from the older man’s wisdom and knowledge of the Word. To his surprise and dismay, it was soon obvious that the older minister’s vague answers were indicative of one who had done little Bible study.A very young minister was sent to counsel a middle-aged man experiencing personal trials. The session failed, mostly because the older man was put off by the fact that someone less than half his age was trying to give him advice about life. Each of these events is real. 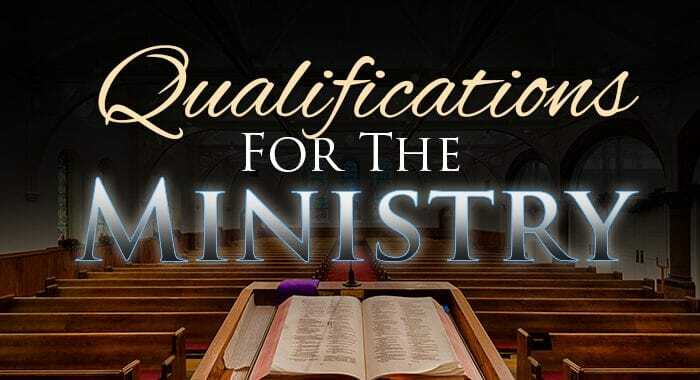 And they all emphasize an important fact when it comes to the office of ministry: It is crucial that those who are ordained meet certain Biblical standards and qualifications. Before they receive ordination, they must have first proved themselves, as Paul clearly explains in 1Timothy 3:10. If an elder who does not qualify Biblically is placed in authority before an Assembly, that ministry will inevitably suffer. Yahweh’s blessing will be lacking, and those responsible for ordaining him will suffer the consequences for their negligence. This is a serious problem in some Assemblies today and the consequences have proved devastating. Men are being ordained who fail in one or several key qualifications laid down in the Word. It is nothing less than a sin to lay hands on a man who does not have the Scriptural credentials, because to do so violates plain commands of the Bible. It also reveals a disturbing lack of a minister’s responsibility to his Assembly to ordain men who do not measure up. – the criteria He emphasizes foremost are not about the man’s ability to preach or teach, but about his character. Behind everything a man says is the testimony of his own life. This is vital, because above all else the office of minister is a spiritual trust. He is responsible for the spiritual guidance of those he serves. If he isn’t living what he preaches and teaches, he has lost his ability to convince. He is his own opposition. We are told to examine the man’s marriage and family life. Nothing tells us more about a man than his relationship with those closest to him. Is he a good husband and father who receives praise from all? Does even the world recognize him as an honorable individual? Are his wife and children in the faith? Has he proven himself by converting those closest to him? Paul is quite specific on this point. The candidate for eldership must have already led his family to the truth he holds dear, which is the same thing he will be doing in the ministry. This qualification speaks volumes about the man and his ability and desire to admonish, guide, and influence others for Yahweh. As Paul admonishes, “For if a man knows not how to rule his own house, how shall he take care of the Assembly of Yahweh?” 1Timothy 3:5. In essence, Paul says that the man considered for leadership in the Assembly has already demonstrated his spiritual qualifications in the most intimate place — his own family. Often Paul refers to saints in his life as his children. John calls them his “children in the faith.” Peter refers to believers as “children.” Why? Because spiritual leadership is like parenting, where you interact with others and set a living example for them, besides teaching and instructing them. The standards Yahweh establishes for the office of ministry are not debatable. Simply put, certain men are fit for leadership while others are not. ALL the qualifications set forth in the Bible must be met before one is considered for such an important and influential office. Any minister who ordains men for their tithing record, friendship or their ability to massage his ego is falsifying the Word and doing irreparable damage to those brethren he has vowed to serve scripturally in all things. Such dereliction of duty and lack of concern for the Body of Messiah are inexcusable. Yahweh went to great pains to ensure that the right men were chosen for His service. Consider His selection of Noah, Abraham, Moses, the prophets, David, and the Apostles. Each was specifically chosen out of the world to serve Him, some with much effort. Are we to do less today? Mistakes made in choosing such men will assuredly return one day to plague and even destroy a work. A true minister is a man who teaches, counsels, guides, manages, and produces for the sake of Yahweh’s truth. Above all, a minister is a leader. A leader is one whose life is so exemplary that others want to copy it. At its essence, leadership means being an example. Therefore, the very character of a man forms the basis for his ministry. If he fails to be a model of what he speaks and teaches, he will not be believed. Such a man is a hypocrite and a mockery to Yahweh’s Word. The strength of what a man says rests in his own virtuous life. All admonishment he gives to others ultimately is judged by whether he lives what he says. Paul explains that a minister like himself must be a good example. “Join with others in following my example, brothers, and take note of those who live according to the pattern we gave you” (Phil. 3:17, NIV). Elders don’t just teach the word, they live it. It is similar to the parent-child relationship, and that is one reason Paul emphasizes that a man’s family life be right. He will be doing much the same for the Assembly as he does for his family. An elder’s life is like a giant video screen on display behind his pulpit, revealing the truth about him for all to see every time he speaks. If he doesn’t measure up to his own teachings, it will quickly be evident. In no profession is it more crucial to embody the highest standards in all aspects of life than for a man who represents the very teachings of the King of the universe! An elder is a servant and the finest example of the kind of life Yahweh expects in all His people. A unique life — proclaiming truth and living it with integrity — is going to have a tremendous impact on others. What is astounding is how many ministers themselves don’t seem to comprehend this basic fact. They are too wrapped up in achieving personal goals in a position they see not as a righteous witness in humble service and sacrifice, but as a position for power and personal glory. No honest minister can ever read these qualifications without reevaluating himself each time he reviews them. The qualifications for eldership, from verses 6-9, can be divided into four categories. The first is sexual purity, then family leadership; the third is general character, and the last is ability to teach. A candidate for ordination must qualify in all four areas. When he does, he will be above reproach. If he fails to measure up to any one of these, he must not be ordained. “But that isn’t fair,” some will argue. “The man is a great speaker, we can overlook some of his shortcomings.” Not Scripturally, you can’t. Some will have trouble accepting Paul’s specific requirements for ministers, especially those who desire to be ordained but who fall short somewhere. Remember, Yahweh Himself set up those standards to be followed. Those men who would argue and contest the standards because they would be permanently disqualified need to consider that half the population is prohibited from the ministry simply by their gender. Women are unable to serve as elders (1Cor. 14:34-35). Right-hearted women accept the fact that Yahweh made them females and go on living their lives to please Him, knowing they can never be ordained. Similarly, men who are not qualified should simply accept that fact. There are other important and necessary ways each can serve the Body. As a senior minister once wrote, “As goes the eldership, so goes the Assembly.” Moral and spiritual looseness by elders breeds the same in the people. No wonder that this issue was of the utmost concern to the Apostle Paul, and others. Paul is the senior elder speaking to the young evangelist Timothy in 1Timothy 3. Paul’s obligation was to ordain men in various cities who would carry on the work that he had started. He realized that the congregation may not always like the selections. To arm the leadership in their choices, Yahweh inspired Paul to establish very specific qualifications they were to follow. lacks control of and honor from his own family. lacks a respectable, trustworthy wife who does not gossip. These qualifications reveal and reflect the actual character of a man. Is it wrong to expect more from elders and deacons? Of course not. That is exactly what we are to do. The 12 Apostles told the early Assembly, “Look you out among you seven men of honest report, full of the Holy Spirit and wisdom,” Acts 6:3. These were exceptional men. Men of proven dedication and ability who had impeccable reputations. They were to serve as deacons, showing us that even the lower levels of office demand the same high qualities in a man, 1Timothy 3:8-13. Rather than defending moral failure, twisting the Bible to accommodate unqualified men, and passing the buck for mistakes in ordinations, Yahweh’s people must demand high standards in their elders and deacons from the start. 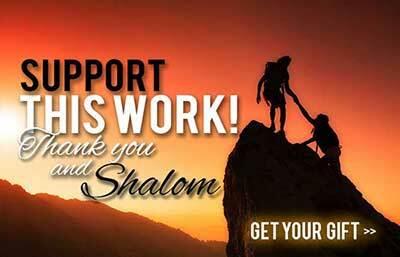 Yahweh Himself does! A man whose wife and family are not with him in the Assembly is not the proper example to the membership. His ability to convince and convict is seriously lacking, notably through his lack of initiative with his own family. On the other hand, if he has children who believe and are not rebellious, they will never bring scandal upon his good name and leadership. Now we can see more clearly some of the reasons behind these qualifications. Suppose you as a father have older children who have not followed Yahweh or been dedicated to the faith, despite all your efforts. You are not responsible for their rebellion if you have done all you can as a believing parent. But neither would you qualify for ordination, according to clear, Scriptural requirements. A common argument is that expecting a man to meet all of these qualifications is holding him to an impossible standard. Listen, if the standard were impossible to meet, then Paul deceived us and no one can ever be qualified. If this were an issue purely about sin, then there would be no point in setting down the requirements in the first place. A man’s conversion and washing away of his sins would make him instantly qualified no matter what his prior sins were. Obviously sin is not the only issue here. In fact, of the 14 prerequisites we find in 1Timothy 3, at least nine are unrelated to sin or are only indirectly associated. A man’s wife is either converted at the point of his ordination or she is not. Again, his baptism does not affect that, either. His being a recent convert does not change with his baptism. In fact, the lateness of his immersion is what makes him a recent convert. His conversion does not immediately affect his Bible knowledge. All of these are simple facts in a man’s life that cannot be changed by repentance and immersion. 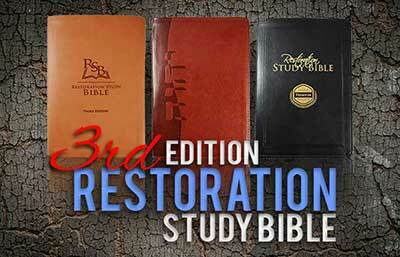 The criteria listed in 1Timothy 3 and Titus 1 are prior qualifications. He is already supposed to be blameless, husband of one wife (one-woman man; married only once — Moffatt, Jerusalem, NRSV), with faithful children, of good character and able to convince the contradictors by his good Bible knowledge. This is not a position for novices or one that a man eventually grows into. He is already there. His reputation precedes him and so does his knowledge of the Word. This is because he is to be a special example to everyone from the very start of his ministry. A teacher is not there to learn himself. He is there to teach, and show by example. The minister is not like the head of a company. He is like a father in a family. He is loving, compassionate, and patient. He has a concern for others far exceeding his care for himself, no matter how great the sacrifice. At the same time he is persuasive, courageous and able to motivate. It goes without saying that he exemplifies the fruits of the Spirit in Galatians 5:22-25. His attributes are also an example for children. To persist in attending an Assembly where the elder is a hypocrite is unacceptable with Yahweh. Some parents will close their eyes to a minister who is morally tainted and continue under his leadership. A child must believe that his spiritual leaders, for all their human failings, are basically honest and obedient to Yahweh’s laws. Children, and especially teens, will spot the hypocrite a mile away and know that phonies do not belong behind a pulpit. Such a man has no business counseling people about their problems while reveling in the same problems himself. Adult example is critical to children. If parents continue to bring a child under the teaching of a man he distrusts, the child may conclude that his own parents are hypocrites as well. As a result, he may rebel or also become hypocritical, thinking that if it doesn’t matter to the minister or to my parents, it shouldn’t matter to me. Showing others the power that repentance and conversion can have in a transformed life is one of the most powerful tools that Yahweh has in bringing people to the truth. A minister must be just that. how do I become a preacher under Yahweh. Shalom Dean, Scripturally, we could not ordain a man that marries a divorced woman. The man, while being the husband to one wife is still defiled through the divorced woman, Matt 19:9, Deut 24:4, Rom 7:2-3. Yahweh Bless.